苏娟华, 孙浩, 任凤章, 等. XRD的TA10钛合金热压缩变形后位错演化分析[J]. 哈尔滨工程大学学报, 2019, 40(2), 406-411. DOI: 10.11990/jheu.201709049. SU Juanhua, SUN Hao, REN Fengzhang, et al. 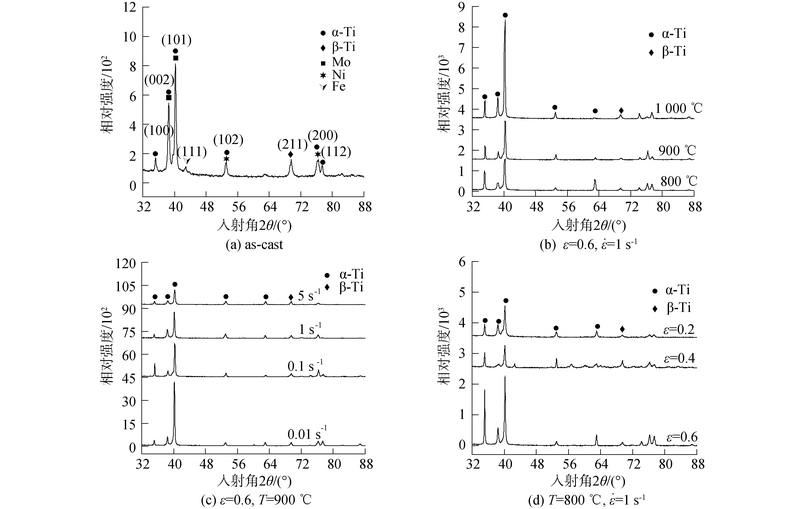 Dislocation evolution analysis of hot compressively deformed TA10 titanium alloy based on XRD[J]. Journal of Harbin Engineering University, 2019, 40(2), 406-411. DOI: 10.11990/jheu.201709049. Abstract: Hot compression tests of TA10 titanium alloy are conducted to analyze the dislocation evolution of this type of alloy, and X-ray diffraction experiment is conducted on the samples after compression. According to the diffraction peaks of different crystal faces, the dislocation density of each crystal face is calculated in combination with the Dunn formula. Results show that the main softening mechanism of the TA10 titanium alloy is dynamic recrystallization below the phase transformation point, which turns into dynamic recovery above the phase transformation point. The primary dislocations consist of column plane (1010), basal plane (0002), and conical plane (1011) for deformed TA10 titanium alloy. 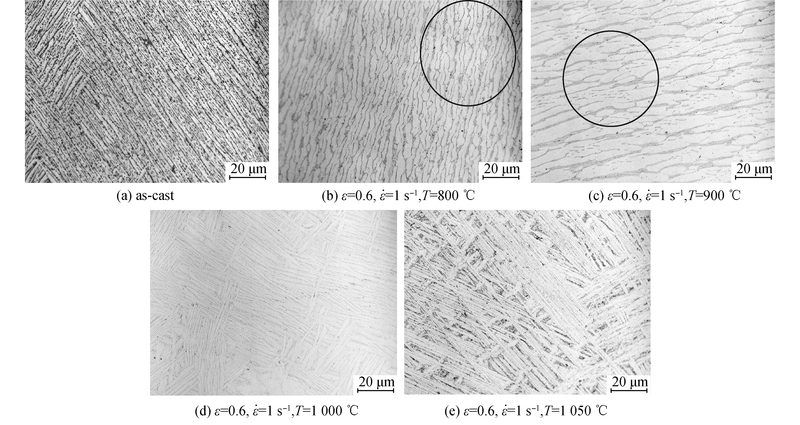 At 800℃~900℃, the dislocation density of the basal plane changes most prominently, and the dynamic recrystallization has the strongest influence on the base surface dislocation when the temperature increases. The total dislocation density grows with the increase of strain rate and decrease of deformation temperature. With the increase of deformation, the total dislocation density rises first and then diminishes below the phase transformation point but is nearly unchanged at 1 000℃ with the increase of deformation degree. The XRD method can be used to quantitatively analyze the evolution of dislocation density after hot compression deformation of TA10 titanium alloy. 葛伟, 邓宁嘉, 丁春聪, 等. TA10钛合金板材的热处理工艺研究[J]. 钛工业进展, 2015, 32(4): 25-28. 张朝晖, 张永超, 刘全明. 氢对TA10合金焊接接头组织和性能的影响[J]. 兵器材料科学与工程, 2018, 41(3): 1-4. 史亚鸣, 黄海广, 李志敏, 等. 带钢热连轧机生产TA10钛合金带的轧制工艺[J]. 中国冶金, 2017, 27(8): 41-44. 苏娟华, 邵鹏, 任凤章. TA10钛合金的高温拉伸断裂极限[J]. 金属热处理, 2018, 43(4): 24-28. 丁永根, 孙建辉, 李萍, 等. TA15钛合金热压缩变形位错演化分析[J]. 稀有金属与硬质合金, 2017, 45(1): 58-62, 66. 丁雨田, 刘博, 郭廷彪, 等. 等通道转角挤压过程中纯铜位错密度变化和力学性能[J]. 中国有色金属学报, 2014, 24(8): 2057-2064. 贾仁需, 张玉明, 张义门, 等. XRD法计算4H-SiC外延单晶中的位错密度[J]. 光谱学与光谱分析, 2010, 30(7): 1995-1997. 王晓强, 崔凤奎, 燕根鹏, 等. 40Cr冷滚打成形中位错密度变化研究[J]. 中国机械工程, 2013, 24(16): 2248-2252, 2256. 周强. TC4钛合金板材电致塑性成形特性的实验研究[D].上海: 上海交通大学, 2015: 44-45. 苏娟华, 邵鹏, 任凤章. 锻造温度对TA10钛合金组织和性能的影响[J]. 材料热处理学报, 2017, 38(4): 60-65. 程帅朋, 苏娟华, 陈学文, 等. 锻造工艺对TA10钛合金组织性能的影响[J]. 河南科技大学学报(自然科学版), 2017, 38(3): 6-9. 程帅朋, 苏娟华, 任凤章. 锻后热处理温度对TA10钛合金组织及性能的影响[J]. 金属热处理, 2016, 41(10): 158-161. 王淑艳, 岳旭, 段晓辉, 等. 加工工艺对TA10大规格棒材力学性能的影响[J]. 世界有色金属, 2016(5): 43-45.